The idea that eventually became Finger Lakes Log Homes started 30 years ago. Owner Michael Griffin had already built his own log home the hard way. He cut his own pine trees down, hauled them out of the woods and trucked them to his building site. The logs were then draw-knifed and were put up by hand without any machinery other than a chainsaw. They were left round which required them to be chinked in the old-style way. Chinking was a very long and tedious job that never seemed to end. After living in this home for a while, Mike saw the popularity of log homes increase dramatically. People were now building them from packages or kits supplying logs that were machined so they went up much faster, looked better and didn't require the tedious chinking. Since Mike Griffin had experience with construction in general and liked the beauty and charm of log homes, he decided to enter into the log home business. Several companies were now machining their logs, and Mike found that the best quality logs were tongue & grooved. This allowed the houses to go up much more easily and provided a good seal between the logs without the time-consuming chinking that Mike had done with his own home. The easiest way to enter the business was to become a dealer for one of the many companies that were selling log home kits. Mike traveled to visit many companies, trying to decide who provided the best quality and pricing and would be a reliable company to deal with. He had almost become a dealer for a particular company until he discovered (through other dealers) that the company could take away his dealership if he didn't meet a sales quota. Was the risk worth it? No. Mike also felt that the prices many companies charged for their packages were quite high and their service was often poor - especially if the log home company was located in another state. After much deliberation, Mike felt that by starting a small company and keeping all costs and overhead to a minimum, he could produce a high-quality package as good as or better than the other companies and at a much lower cost than the other companies. He then proceeded to purchase the necessary machinery, built buildings and designed some affordable home packages. With much hard work he had started his own log home manufacturing company. What he didn't do was to build a fancy model home, print color brochures or hire salesmen and a lot of staff. The new company was named Finger Lakes Log Homes Inc. after the Finger Lakes area of New York State that Mike grew up in. The Finger Lakes area is well known for its beautiful lakes, grape vineyards and wineries. The home packages he designed were named after those lakes and the counties in that area of New York State. Mike decided to keep his company small and to oversee all aspects of running the business. When you visit Finger Lakes Log Homes you will speak to him, not a salesman. You may also find him running a forklift at the plant, adjusting the log milling machine, checking the logs as they are milled, inspecting materials arriving at the plant as well as getting materials ready for shipment to a customer's job site. If you buy a package, you may also see him driving the delivery truck to your new home site. A big emphasis is put on quality control. Finger Lakes Log Homes starts out by buying the lumber to make their logs from in a timber shape or cant from a few select sawmills that have provided the highest quality lumber throughout the years. The timbers are allowed to dry in our storage yard for about a year. This not only lets those timbers dry naturally, but it also culls out logs that will warp or have other defects. Those logs are rejected and they are not put thru the milling machinery. This helps ensure that you get a high-quality log that will be less prone to problems after it is installed in your home. Mike takes the time to frequently inspect and adjust the milling machinery so the equipment works to its best capability. The cutting knives that shape the log home logs, log siding, log floor beams, 1x6 tongue and groove paneling, 2x6 tongue and groove flooring and other products that we sell need to be sharpened regularly. This is also done at the mill where there is a tool and cutter grinder set up in the shop just for that purpose. Keeping those cutters sharp and in good condition ensures a quality product. Since we usually deliver the kits on our own truck, care is taken to properly package and load materials so they arrive safely at your job site in good condition. Also, since our truck is much smaller than the tractor-trailers most big companies use, we can drive the truck and materials into many sites not accessible by the big rigs (you get stuck unloading the materials on the road if they can't get up your driveway to your construction site). In the early years of the business, Mike was also a log-home builder. As the business grew, he had to quit building and concentrate on the sales and manufacturing plant. Again, this was to assure quality control, keep pricing low and let him give attention exclusively to manufacturing high-quality products and providing excellent customer service. 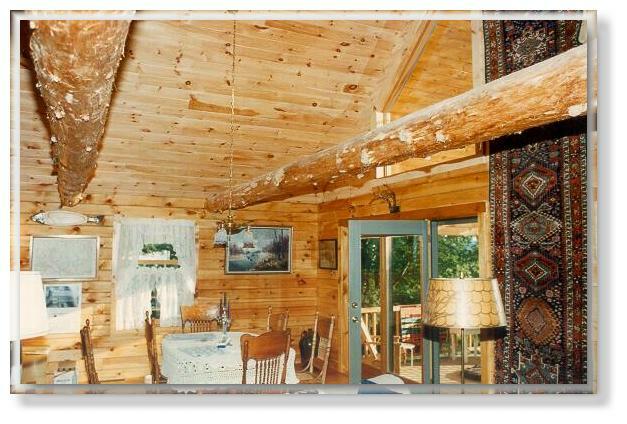 Mike's building experience is also very useful to anyone purchasing a log home from him. He can provide assistance all the way from designing your home to advising you during the construction phase. As the above information shows, Finger Lakes Log Homes was established and continues to operate as a company that really does provide a high-quality product at an affordable price. We can make your dreams for a new log home come true.